Eugene Sims was hurt after making a huge sack in Week 1. 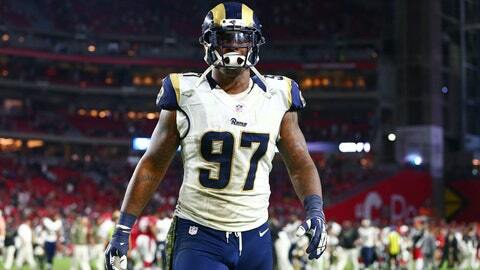 St. Louis Rams defensive end Eugene Sims returned to practice Wednesday for the first time since injuring his knee in Week 1. Sims, ironically, was hurt as he made one of the biggest plays of the game in the Rams' season-opening upset of the Seattle Seahawks. He sacked quarterback Russell Wilson at the end of regulation to send the contest into overtime. It was the ninth career sack for Sims, who was a full participant at Wednesday's practice. Also back at practice was running back and special teams standout Chase Reynolds, who has been sidelined with a knee injury sustained in the opener.